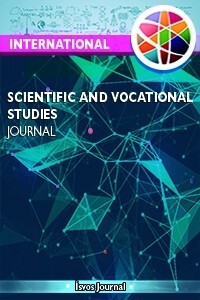 The International Scientific and Vocational Studies (ISVOS) Journal is an peer-reviewed internationally respected journal which is published twice a year. In the International Scientific and Vocational Studies Journal, original research on engineering, science and natural sciences are accepted. International Scientific and Vocational Studies Journal is online, open access, double blind peer-reviewed, international research journal. Language of the journal is English and Turkish. ISVOS Journal have been publishing twice a year in June and December. Our Journal's aim is to share knowledge with academicians, teachers and students of engineering, science and natural sciences, both in their own fields and colleagues, by gathering scientific and professional studies. However, our another aim is to provide an internationally appropriate platform with the necessary features by discussing engineering, science and natural sciences innovations for provide a better education for future generations. We hope that our journal will bring a new perspective to that platforms and will contribute to engineering, science and natural sciences studies. ISVOS is published online bi-annually (June and December). It is mandatory that the authors submit a report of the iThenticate program of plagiarism.